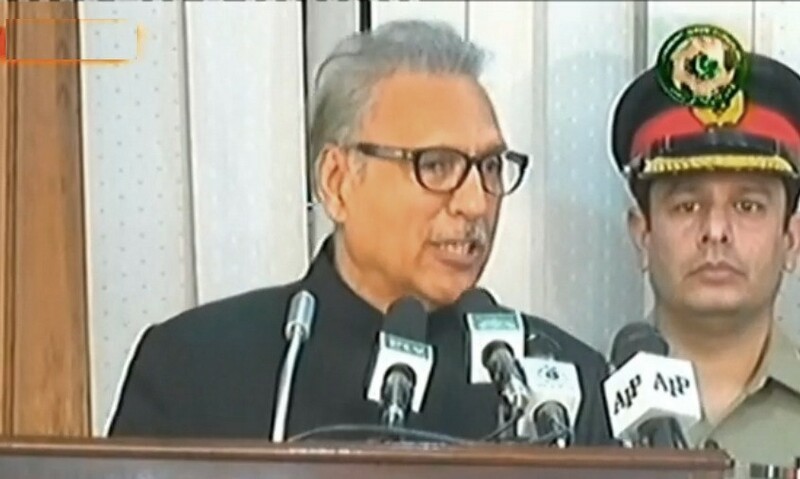 Muzaffarabad, February 05 (KMS): President Dr Arif Alvi has urged India to stop its ongoing atrocities in occupied Kashmir and allow the international observers to investigate the human rights violations in the territory. Addressing special session of Azad Jammu and Kashmir Legislative Assembly in Muzaffarabad on the occasion of Kashmir Solidarity Day, today, the President said that all the political parties in Pakistan were on the same page vis-à-vis Kashmir dispute and they would always stand by their Kashmiri brethren. Dr Arif Alvi demanded of India to immediately release all Kashmiri political prisoners and abolish the black laws in occupied Kashmir. He said India should lift restrictions on the media and internet in the occupied valley so that the Kashmiri people could exercise their right to expression. He also called upon the United Nations to send a fact-finding mission to occupied Kashmir to take stock of the ground situation of the territory. He asked India to immediately release all political prisoners in occupied Kashmir and allow freedom of speech to the Kashmiris. He urged India to halt the use of firearms as well as pellet guns against the innocent Kashmiri people in the occupied valley, and called on the Indian authorities for withdrawal of aggressive black laws. He also urged Indian authorities to open up the communication links for international and social media networks. The President paid rich tributes to the sacrifices rendered by the Kashmiri people and said India would not be able to suppress the Kashmiris’ freedom struggle through oppression or use of force. He said India is not ready to hold dialogue with Pakistan in order to perpetuate its illegal occupation of Jammu and Kashmir. He, however, maintained that the solution of all disputes lies in peace dialogue. The Prime Minister of Azad Jammu and Kashmir, Raja Farooq Haider, on the occasion thanked Pakistani leadership for consistently supporting the Kashmiri people in their struggle for right to self-determination. At the outset, the house also offered fateha for the Kashmiri martyrs.